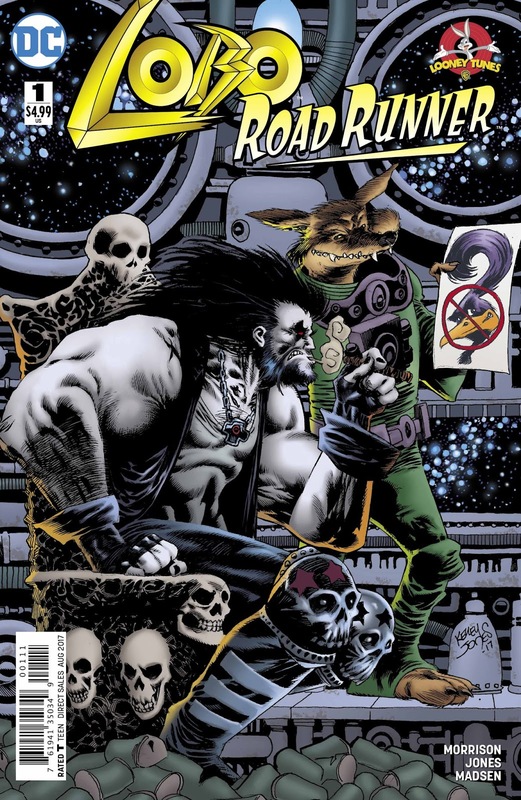 Another unlikely team-up from the Looney Tunes titles coming this month, I think that in the interest of full disclosure I should say outright that I like the character Lobo more than the Road Runner. I thrilled to the exploits of Wile E. Coyote and that rascally bird as a kid, but by the time I was the wizened age of ten I found such physical humor beneath me. 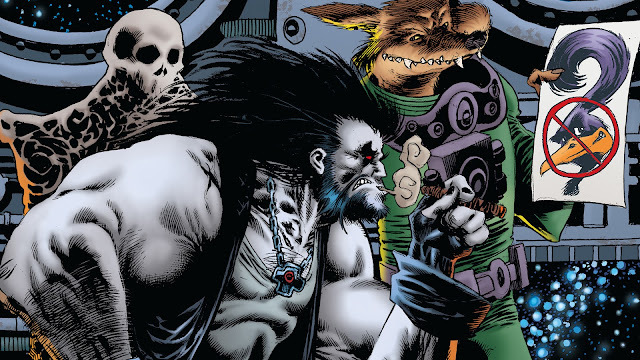 But Lobo, that’s comedy for real thinkin’ people! So let’s see how this peanut butter and jelly sandwich tastes and check out my review of Lobo/Road Runner Special #1, right here! 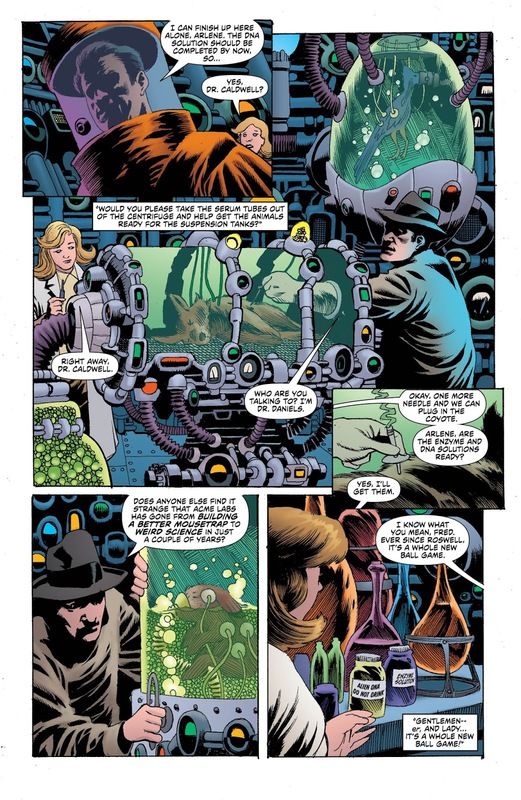 So this story takes a different tack from the other Looney Tunes/DC team-ups we’ve seen so far: it attempts to explain how the Looney Tunes were created. It seems that in the 1940s and 50s, during the first major UFO flap of the 20th century, animals were knocked out in the shadow of atomic testing and injected with some alien goop retrieved from the scene of the Roswell UFO crash to, uh, see what happens. And this happened at Area 52 (of course) just to round out the pedigree. They’re all kept in tanks of green fluid—and they sort of look like the characters they’re supposed to be, except a little darker. Well, one day, they all escape—and presumably there’s a story to be told about a ravenous Sylvester the Cat, stealing babies from nurseries and clawing authorities with razor-sharp retractable talons, but the character we’re interested in here is the coyote. Who, in having freed himself using a hairpin and a chemical explosive, has proven to be quite…wily. Out in the wild, the coyote searches for food, and eventually finds an elusive road runner. Throughout the decades, he attempts to eat the bird, and every time he is thwarted in the most Looney Tunesical of fashions. Eventually, the coyote is recaptured and brought back to Area 52, where he’s in a cell next to Sam the Sheepdog…who is more like Sam the humanoid cartoon dog monster. He teaches the coyote to speak, and then suggests that he hop into space and hire famous bounty hunter Lobo to kill the road runner. 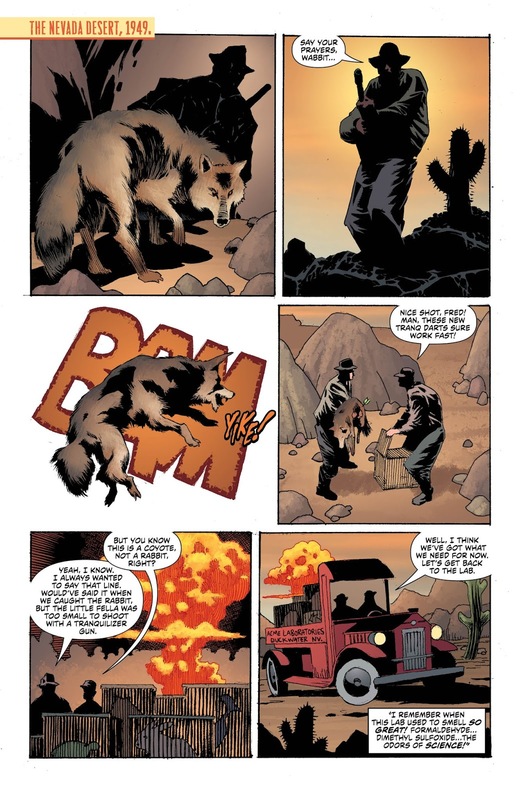 So, to make a long story short, the coyote does that, and happens upon Lobo on his way to fulfill another contract—so the coyote agrees to complete that if Lobo will kill the road runner instead. So it turns out the guy the coyote has to kill is Kilowog of the Green Lanterns, but he convinces the one that hired him (a failed Lantern recruit) to drop the contract. Meanwhile, Lobo isn’t having much luck with the road runner, being subjected to similar humiliations endured by the coyote for decades. Then it turns out this was all orchestrated by the original Area 52 scientist or something? I dunno, I lost interest in this pages ago. The back-up is a more cartoonish story featuring several Warner Bros. cartoon characters, wherein Bugs Bunny makes Lobo fulfill the final eight pages as part of a contractual obligation. It’s not hilarious, but there are funny moments. The other story, however, is just so boring. Lots of back and forth, superfluous information that drives the story nowhere, and a whole sci-fi angle that was bloated and unsatisfying. 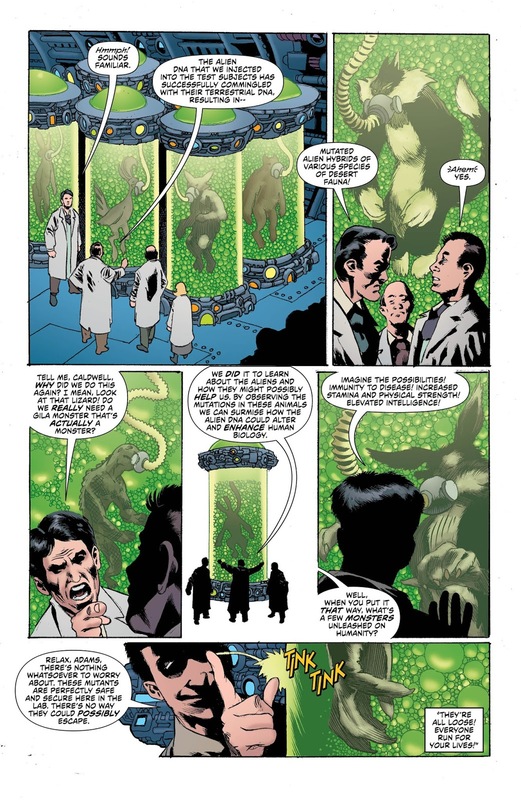 Kelley Jones provides a creepy vibe that, while entirely his style, may not have been warranted in a book that is essentially a complete goof on the face of it. And probably should have been written as more of a goof. Harken ye to the sad tale of a mutated coyote's unrequited desire to catch and eat a road runner. Leave with heavy hearts but enlightened minds...or lightened minds. This story is pretty boring to be starring the Main Man and the Fast and the Furious of the Looney Tunes set. The back-up is nominally better.